Dealers and Repair Shops please call for separate pricing. Mylex International has been rebuilding powerstroke injectors for over 5 years now! We have highly trained technicians that know how to rebuild an injector correctly. You could buy a test stand, but just buying a test stand will not build a good injector. If you want to save money and get a great injector; let us do the work. Comes with gasket set and 12 months unlimited mile warranty (on workmanship, and materials only) (Fuel and Oil related failures not warranted) All cores must be in take off condition for this price. Broken down and pre-rebuilt injectors are more! 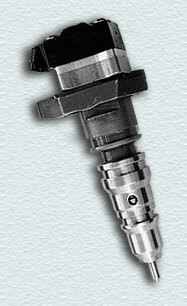 If test OK, this means that this injector presently meets Standard Specifications. No other warranty is implied. Core Charge for Power Stroke Injectors $200.00 each (No Incomplete or Burnt cores will be accepted and solenoid must be in good condition for core credit). Mylex International Inc. has a large parts supply for the Power Stroke and Heui Injectors! All names, numbers, symbols, descriptions are for reference purposes only and do not imply that parts listed are of any original equipment manufactures.